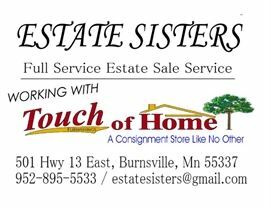 AddressThe address for this sale in Burnsville, MN 55337 will be available after 9:00am on Wednesday, July 24th, 2019. * Cash or Credit Cards over $25.00 With a 3% fee. * We do not give out prices prior to the sale. * We will be handing out numbers 1/2 HOUR prior to the sale, given in the order the customers arrive at the door. knowledge and note any defects that we may be aware of. given on any merchandise is to the best of our knowledge. Everything is sold AS IS, WHERE IS. Please preview and inspect all items before offering to purchase. PLEASE REMEMBER TO BRING HELP & TOOLS FOR MOVING LARGER ITEMS !! !